Andrew Porter’s literary fiction has appeared in One Story, Epoch, and NPR’s Selected Shorts, among other publications. His brilliant collection The Theory of Light and Matter earned the Flannery O’Connor Award for Short Fiction. He’s received a Pushcart Prize, attended the Iowa Writer’s Workshop – is this not a staggering bio? 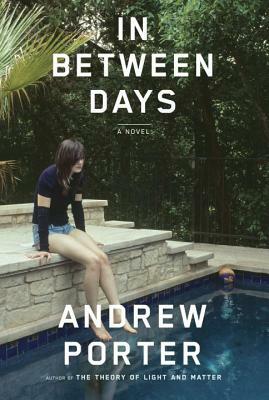 Porter’s first novel, In Between Days, hits shelves today. Liz Wyckoff, one of our intrepid booksellers and a member of our illustrious events staff, had the opportunity to ask Porter a few questions about his new book and the writing life. You can catch Porter reading from In Between Dayshere at BookPeople next Monday, September 10 at 7pm(and we highly recommend that you do). BOOKPEOPLE: Your 2008 short story collection, The Theory of Light and Matter, includes several stories set near (or in a place that resembles) your hometown of Lancaster, Pennsylvania. Now, as a current resident of San Antonio, you chose Houston as the setting for your debut novel, In Between Days. How do you go about determining settings for your work? Do different challenges arise when you’re writing about a place from your past, as opposed to writing about your current location? ANDREW PORTER: For some reason, there are certain settings that I find myself returning to again and again in my work. One of those settings is central Pennsylvania, where I grew up, and another is Houston, Texas, where I lived for one year on two separate occasions. It’s strange. Even though I’ve lived in San Antonio for the past eight years, I’ve never had the desire to set a story here; whereas, I only lived in Houston for two years and find myself returning to it more frequently than almost any other setting. I don’t know how to explain this except to say that there must be something about the settings I return to that resonates with me emotionally. As for your second question, I actually think it’s a little easier to set stories in places I “remember” as opposed to the place I’m currently living. With Houston, for example, the version of Houston I depict is largely an imaginary one, informed by my distant memories of living there, and I think that’s one of the reasons I’m able to see it so clearly when I’m writing. This might sound a little counter-intuitive, I suppose, but I honestly find it harder to see a setting clearly when I’m actually living in that place. BP: You wrote In Between Days from the perspectives of four characters: a divorced couple, Elson and Cadence, and their two children, Richard and Chloe. I’m interested in how you managed to tell one overarching story from four different characters’ viewpoints—such an impressive feat! How did you determine the order of the narratives? Also, how did you determine which character’s perspective would start and end the novel? AP: Telling the story from multiple perspectives was definitely a challenge, as I’d never done anything like that before, but it was also a mode of storytelling that seemed to evolve fairly naturally out of the story. For example, once I’d finished the first chapter of the novel (which is told from the father’s perspective), my first instinct was go into the head of his son, and then, after that, his daughter, and then finally his wife. Before I knew, it I was juggling four different perspectives, and though I’d never had to juggle four perspectives before, I didn’t question it too much. In terms of the order, that was also something I didn’t really question. Each time I finished a section I’d simply ask myself which perspective I waned to enter next, and then go with that. I always knew the novel would start with the father, as that was the first chapter I wrote, but I didn’t know whom it would end with until I got to those final pages. BP: All of the characters in this novel have extremely rich and interesting backgrounds. They include, for example, an architect, an Indian-American college student, and a young gay poet. Did you do any research to fully inhabit these characters as you wrote from their perspectives? Did you read any specific material that inspired you in the creation of this novel? AP: One of the wonderful things about writing fiction is that you can assume the perspective of characters that are extremely different from you and, in doing so, gain a sense of empathy for their experiences and their struggles. I didn’t do any outside research on these characters, but I do think that they’re all probably composites of various people I’ve known over the years. For example, I’ve never been an architect, but I do happen to know a lot of architects, and through my conversations with them I’ve gained a pretty good understanding of what an architect’s life might be like. BP: Without spoiling anything for those who have not yet read the book, I have to say that the ending came as a big surprise to me. I’m curious to hear your thoughts on endings in general. How do you know when you’ve hit upon the right ending for one of your works, whether it’s a story or a novel? And what do you think a really good ending should do? AP: I’ve always felt that a good ending should feel both surprising and inevitable. It shouldn’t be something that the reader is expecting when she comes to it, but at the same time it can’t be so much of a surprise that it pushes believability. It has to feel like something that has grown organically out of the story. In terms of my own strategy for endings, I’ve always tended to trust my instincts, and I also make a conscious effort not to try to figure out the ending before I get there. With In Between Days, for example, I had no idea where I was going to take the story in that final chapter until I’d actually reached that moment. And so, in this way, the ending was as much a surprise to me as it is (I hope) for the reader. BP: You’re currently an Associate Professor of English and Director of the Creative Writing Program at Trinity University. How do you balance your writing life with the demanding work of teaching and directing a program? How does your work with young, developing writers affect your own writing? AP: I think teaching writing has actually made me a better writer, and it’s definitely made me a better reader. If I wasn’t constantly being forced to express my opinions about various aspects of craft or reflect on the narrative approaches of the numerous writers we read, I wouldn’t be as good a reader, or editor, of my own work. In fact, many times an issue will come up in class that relates directly to something I’m working on at that moment, and I’ll have one of those “ah ha” moments as I’m sitting there in front of my students. As for finding time to write, it’s always a challenge, but I find that sticking to a routine really helps. As long as I get a little writing in each day, I eventually get things done. BP: With a short story collection and a novel now under your belt, what’s next for you? Do you find yourself leaning toward the short or long form, or both? AP: At this point, I’m leaning toward both. As soon as I got into the final editing stages of my novel, I started pulling out some of the old short stories I’d been working on before I began it. At the same time, I’ve also begun to work on a new novel project, set partly in Texas, which I’m feeling pretty excited about. Previous Post September’s YA Buzz Book Is…..
Pingback: Largehearted Boy: Book Notes - Andrew Porter "In Between Days"